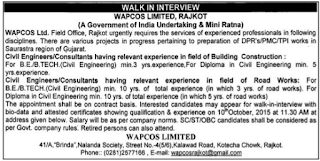 Water Resources, Power and Infrastructure Sectors (WAPCOS) Limited, Rajkot published notification for recruitment for below mention posts. You can view official notification by following link. Educational Qualification: B.E. / B.Tech. (Civil Engineering) minimum 3 years experience, for Diploma in Civil Engineering minimum 5 years experience. How to Apply: Interested candidates may appear for walk-in-interview with bio-data and attested certificates showing qualification & experience at given below address. Venue: WAPCOS Limited, 41/A, Brinda, Nalanda Society, Street No. 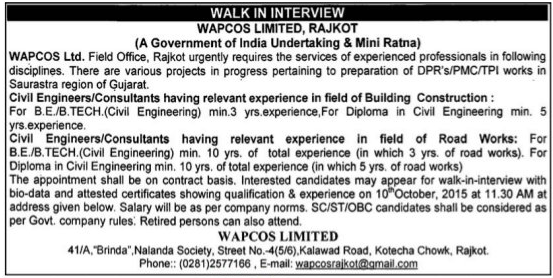 - 4(5/6), Kalawad Road, Kotecha Chowk, Rajkot.